Enjoying an enviable rural location with BEAUTIFUL VIEWS to the rear, this IMMACULATELY PRESENTED DETACHED HOUSE must be viewed to appreciate all that it has to offer. It features spacious and flexible 5 BEDROOM ACCOMMODATION and has the added benefit of a SMALL PADDOCK OF LAND across the road. The property is presented to a high standard throughout having been much improved and extended by our clients in recent years. ABOUT LANE FARM Lane Farm is believed to originally be 2 farm cottages dating back to circa 1820, but has been a single dwelling for quite some time. Our clients purchased the property in 2003 and have carried out comprehensive works to improve and extend the property since then. A two storey extension was added to the side circa 2005 followed by a single storey extension to the rear. This has created a flexible and comfortable home which combines the traditional integrity of the original property with the convenience of modern fittings. On the ground floor there is an entrance porch, large lounge with stone fireplace and multi fuel stove, dining room, quality fitted kitchen with open plan breakfast room, sitting / play room, oak framed garden room, utility and downstairs wc. Upstairs there is a landing, house bathroom, 4 double bedrooms and a single bedroom / office. The two main bedrooms each have en-suite bathrooms. The property is beautifully presented throughout with all of the bathrooms and kitchen having been replaced during our client's ownership. The windows have also been replaced with uPVC double glazing throughout (except to the oak framed garden room) and there is an oil fired central heating system which is run from the Redfyre range in the Kitchen. It is connected to mains water and electricity and drainage is to a septic tank which is shared with the adjacent property. Externally there is driveway to the side of the house which leads to the attached double garage. The rear garden has been attractively landscaped and adjoins open fields. There is a further lawned garden to the side. Opposite the property there is a wonderful grassed paddock with a small wooded area - perfect for an aspiring smallholder! ENTRANCE PORCH The property is entered through a composite entrance door into the porch which has windows to either side, stone flagged floor and radiator. LOUNGE 21' 4" x 17' 8" (6.5m x 5.38m) The lounge is of a particularly good size and features solid oak flooring, exposed beams to the ceiling, chimney breast with stone fireplace and a log burning stove, 4 central heating radiators and glazed double doors opening into the adjoining garden room. Wooden double doors within an arched doorway open into the dining room. GARDEN ROOM 10' 7" x 10' 1" (3.23m x 3.07m) A superb addition to the property, this oak framed garden room features picture windows to the rear enjoying the views, 2 velux rooflights to the angled ceiling, glazed double doors to the garden, tiled floor with underfloor heating and a door to the sitting room. DINING ROOM 14' 8" x 12' 2" (4.47m x 3.71m) Featuring a beautiful stone fireplace with solid fuel stove and adjoining stone shelving, oak flooring, staircase to the first floor with wrought iron balustrade, 2 windows to the front, beams to the ceiling and central heating radiator. BREAKFAST ROOM 13' 7" x 9' 5" (4.14m x 2.87m) With window to the rear, inset spotlights to the ceiling, built in pantry and cloaks cupboards. DOWNSTAIRS WC With low flush WC and hand washbasin upon a vanity unit. KITCHEN 15' 10" x 8' 2" (4.83m x 2.49m) The kitchen is located adjacent to the dining room and is fitted with an excellent range of fitted oak fronted base units and wall cupboards with granite worksurfaces, integrated dishwasher, fridge, freezer and microwave, Redfyre range cooker, exposed beam to the ceiling and tiled floor. The kitchen is open plan to the breakfast room and has a glazed door opening into the sitting room. SITTING ROOM 14' 9" x 10' (4.5m x 3.05m) Suitable for use as a sitting room or playroom and forming part of the lean to extension at the rear. With windows to the side and rear enjoying the views, composite door to the side and engineered oak flooring. UTILITY ROOM 8' 9" x 6' 1" (2.67m x 1.85m) Featuring fitted base and wall cupboards with laminated worksurfaces, stainless steel sink unit, plumbing for automatic washing machine, composite entrance door to the side and central heating radiator. LANDING With oak flooring, exposed beam to the ceiling and built in airing cupboard with hot water cylinder. BEDROOM 1 16' 5" x 11' 7" (5m x 3.53m) With windows to the front and side enjoying the views, built in 5 door wardrobes and central heating radiator. ENSUITE 9' 10" x 5' 11" (3m x 1.8m) With 4 piece suite in white comprising low flush wc, vanity washbasin, bath and shower cubicle, window to the rear enjoying the views, tiled floor and splashbacks, inset spotlights to the ceiling and central heating radiator. BEDROOM 2 16' x 9' 6" (4.88m x 2.9m) With exposed beam to the high angled ceiling, windows to the front and side, central heating radiator and recessed wardrobe. 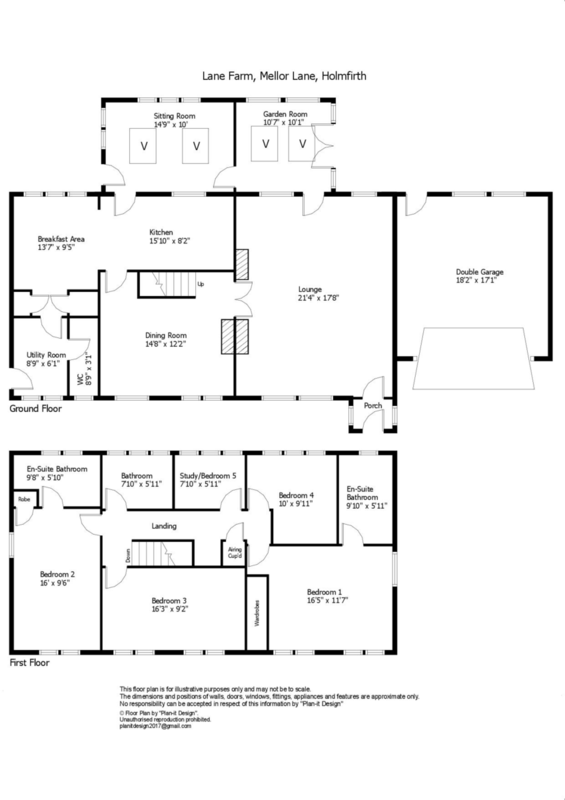 ENSUITE 9' 8" x 5' 10" (2.95m x 1.78m) With three piece suite in white comprising low flush wc, pedestal washbasin and bath, half tiled walls, window to the rear, exposed beam to the angled ceiling and central heating radiator. BEDROOM 3 16' 3" x 9' 2" (4.95m x 2.79m) Another double bedroom with 2 sets of windows to the front, exposed roof truss and 2 central heating radiators. BEDROOM 4 10' x 9' 11" (3.05m x 3.02m) With windows to the rear enjoying the views and central heating radiator. BEDROOM 5 7' 10" x 5' 11" (2.39m x 1.8m) A single bedroom which is used as a study, with window to the rear enjoying the views and central heating radiator. BATHROOM 7' 10" x 5' 11" (2.39m x 1.8m) With three piece suite in white comprising low flush wc, pedestal washbasin and bath with shower over, half tiled walls, tiled floor and central heating radiator. DOUBLE GARAGE Attached to the side of the house with remote controlled sectional shutter door up and over door, electric light and power supply, water point, window and door to the rear. In front of the garage there is a tarmac driveway / parking area, with scope to add additional parking if required. A gravelled path leads to the rear. GARDENS To the rear of the house there is a pleasant enclosed garden area which has been landscaped to provide a paved patio on two levels behind the house and garage. Below this there is a lawned area which slopes down to a further patio area with garden shed and summer house. LAND On the opposite side of the road there is a paddock of land with a small wooded area (totalling approximately 0.57 acre). This land is used for keeping hens and pigs by our clients but could meet a number of other uses. There is a small wooded area to the lower side of the plot with foot access. To the top side there is a gateway with access into the field area. LOCATION From the centre of Holmfirth head out on the A635 Greenfield Road for approximately 1 mile passing the bus turnaround as you leave Holmfirth Centre. Turn left onto Black Syke Lane (signposted for the Booth House Gallery). Follow this road down into the bottom of the valley then back up the slope. At the top of this lane turn right and continue up the hill. The property will be found on the right hand side. SITE PLAN For identification purposes only.